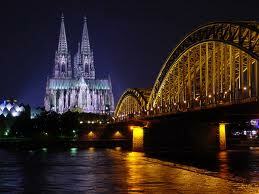 Cologne is the fourth largest city in Germany. Population of this city estimated as 10 million. It located on banks of the river "Rhine". It was also one of Germany's oldest city. Founded on 38BC by the Ubii, a Germanic tribe. The city became the provincial capital of Germania Inferior in 85 AD. The city has around 30 museums and several galleries. Cologne Cathedral, a Roman Catholic church present in this city. It is a World Heritage Site as well.